Will Gators have déjà vu all over again? Last year Florida stumbled in the SEC Tournament, getting blasted by Arkansas 16-0. In 2018 they were unceremoniously bounced by LSU 11-0. Florida was a National Seed in each season with the Regional pitting them against a team from the New York (Marist/Columbia). In each game they received a sloppy start from their No. 3 pitcher (Kowar vs. Marist/Mace vs. Columbia) but pulled away late to beat an overmatched opponent. The second game of the Regional pit Florida against a tough in-state opponent (USF/FAU). Florida got a gem from their ace (Faedo/Singer) and won close contests with Michael Byrne closing out both. The third game saw a scrappy three seed (Bethune-Cookman/FAU) with some good hitting beat the Gators. Brady Singer struggled against Bethune-Cookman as they won their first ever game over Florida and Kowar gave up 11 runs, 7 earned to FAU to force a seventh and deciding game in the Regional. Florida started a freshman (Kirby McMullen/ Jack Leftwich) who gave solid starts before giving way to another freshman (Austin Langworthy/Tommy Mace) before closing it out with Byrne to reach a Super Regional. In 2017 it was Wake Forest, who came into the series leading the nation in home runs. This year it was an Auburn ballclub that was coming to Gainesville after sweeping the Raleigh Regional outscoring their opponents 40-12. In 2017 Alex Faedo stuck out nine over four innings of work against Wake Forest before rain washed away his start. Brady Singer threw four strong before Byrne closed the game out. In 2018 Singer threw seven innings of one-run baseball as the Gators plowed its way through Auburn to win 8-2. The second game of the Super Regional in each season was tight, back and forth but ultimately ended in Florida’s opponent walking off with a win. Wake Forest’s Ben Breazeale hit a walk off home run in 2017 and Auburn’s Luke Jarvis’ single walked the Tigers off and extended their season a day. In 2017 Florida turned to a freshman (Tyler Dyson), which O’Sullivan will do again Monday with Jack Leftwich or Tommy Mace. In 2017 Dyson threw five scoreless innings in relief of Brady Singer, who was washed away after two innings. Dyson was relatively untested and unknown pitcher at that point of the season but played a huge part of the rest of Florida’s National Championship run. The Gators have been on a mission since they got back on the field in the fall. They’ve played 65 games this season with a target on their backs, getting every team’s best shot. It’s been a grind. One of the two teams that take the field at McKethan Stadium tomorrow will have just nine innings left in their season. 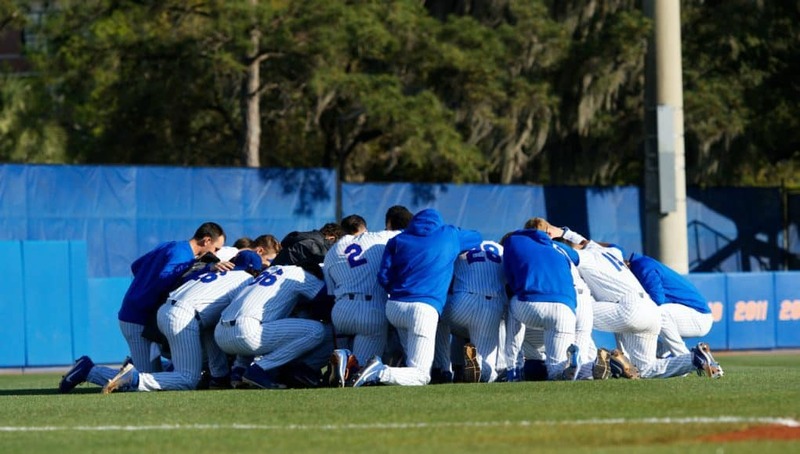 Florida hopes to draw from its experience in 2017 to make sure they have more than nine innings left in 2018.